The project involved the remediation and upgrade of a reservoir consisting of several adjacent and inter-linked storages for high quality filtered drinking water. The reservoir was a vital component of the potable water distribution system for a large urban population. However, the storages were uncovered and hence they were a potential point of contamination of the water supply. They had been built many years ago, some of the electrical and mechanical components were obsolete and the whole site was in need of work. The remediation included constructing covers for the storages, as well as upgrading electrical and control systems, inlet and outlet mains, pumps, valves, interconnecting pipes, other hydraulic structures and other aspects of the physical infrastructure. Prepare a Project Risk Management Plan to direct the implementation of the strategy. Several formal risk assessments were undertaken. The first assessment took place before the design and construct (D&C) contractor had been appointed. It was followed a year later by an update assessment after the preliminary design had been completed. The risk management process was based on the company’s risk management framework, compatible with ISO 31000 Risk management – Principles and guidelines. Management reviews of draft briefing materials. The main stakeholders were the reservoir operators, the reservoir owner, water customers, the local community, and government health and environmental regulators. Financial, economic, legal, social and other business risk areas. Figure 1 shows the key elements for the update workshop held following the completion of the preliminary design; the first workshop used a similar but slightly shorter set. Most of the participants attended both parts of each workshop for their full duration, but there were a few individuals with specific contributions and limited availability who attended only one session. There was substantial overlap in participation between the first and update workshops, despite the extended intervening period. Context material was compiled into a comprehensive briefing note for participants in each workshop. Where the risks were fairly specific, estimates of the consequences and associated likelihoods, using the scales in the company’s risk management framework. Nominated and agreed a risk owner for each risk. Over a hundred risks were identified in the initial assessment and revised in the update. The risk profile after the update workshop is shown in Figure 2. 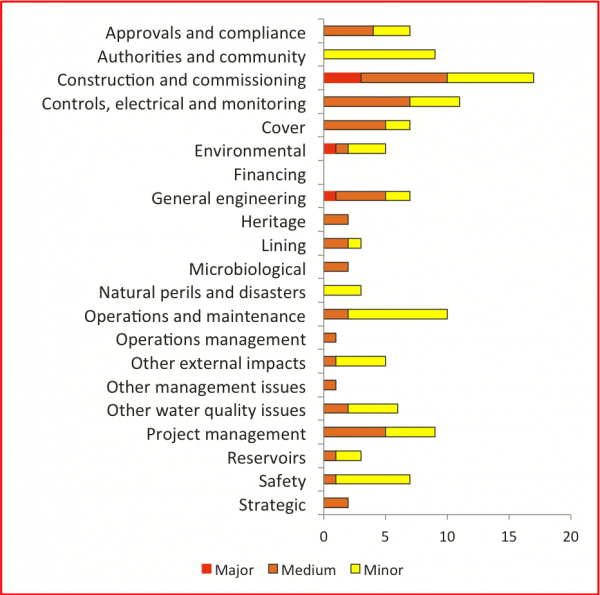 Of the key elements, construction and commissioning generated the largest number of risks, including three of the five major risks identified. Uncertainty about the design for handling stormwater from the roof of the reservoir, possibly affecting building and other approvals and causing delay. When the update risk assessment was conducted a year after the first, several major risks had become minor, largely as a result of treatment actions that had been implemented successfully during the intervening year. Risk owners, identified in the risk assessment workshops, developed draft treatment plans for ‘their’ risks, using the template in Figure 3. These formed a starting point for a series of risk treatment workshops, each with its own area of focus and group of participants selected according to the subject matter. 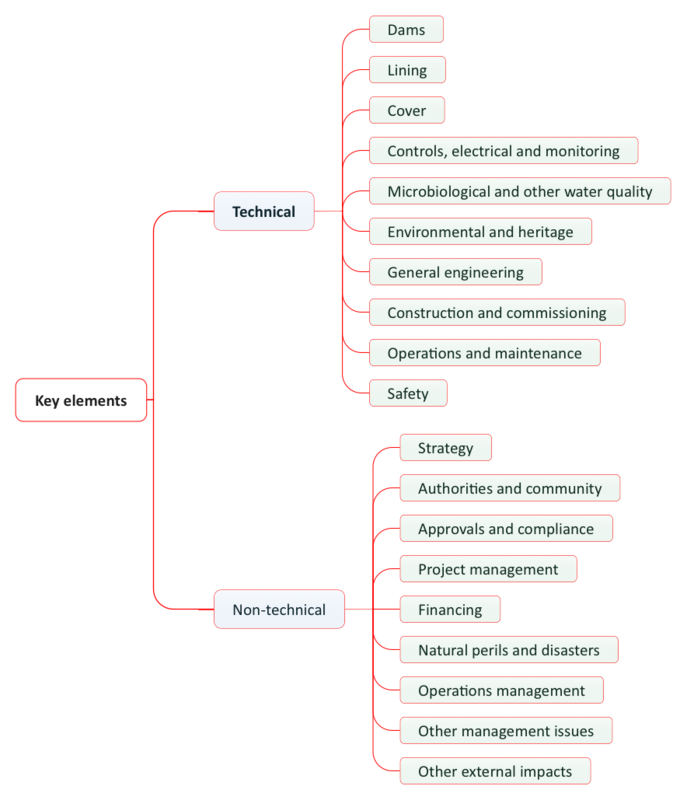 The context setting, risk assessment and risk treatment activities formed the basis for the Project Risk Management Plan. The plan covered a wide range of topics, summarised in Table 1. 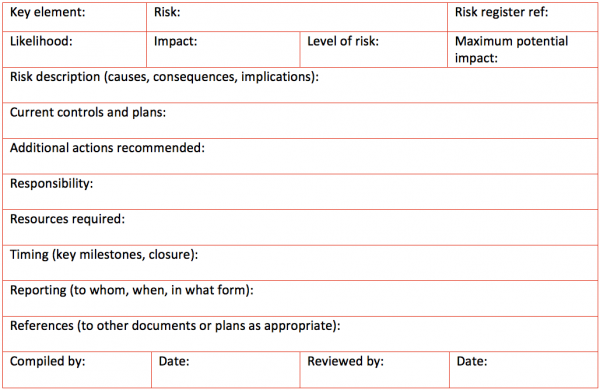 The updated risk register was included in the plan as an appendix. Both the plan and the risk register were intended to be living documents that would be updated regularly as part of routine project management processes. This had taken place successfully over the year between the initial and update assessments. The activities described in this case demonstrate many aspects of good project risk management. Risk management was a continuous activity, closely linked to project management activities. The risk register and the status of treatment plans were all updated more-or-less continuously, with more formal risk assessment updates at major milestones. For example, the risk register had been maintained regularly, but the update risk assessment discussed here was undertaken as a more formal activity on completion of the preliminary design. People with the appropriate skills, experience and expertise participated in the risk assessments. The assessment workshops were structured so that those with time constraints could participate where they were most needed and contribute usefully to the outcomes. Formal treatment plans were developed, tracked and incorporated in project activities. Although the necessity of this might seem obvious, it does not always happen! The project risk management plan provided a comprehensive structure and process for risk management through the life of the project. It had a strong focus on monitoring and review, to ensure that risk management was a continuing process through the project and closely integrated with regular project management activities. It was intended to be a living document that provided an up-to-date indication of the status of risks and their treatment; early indications over the first year were that it was indeed maintained, used appropriately and delivered value to the project.